Based upon Bram Stoker’s classic novel and the many films it eventually spawned, Dracula is a five reel and four row slots game with a pre-set 40 paylines. 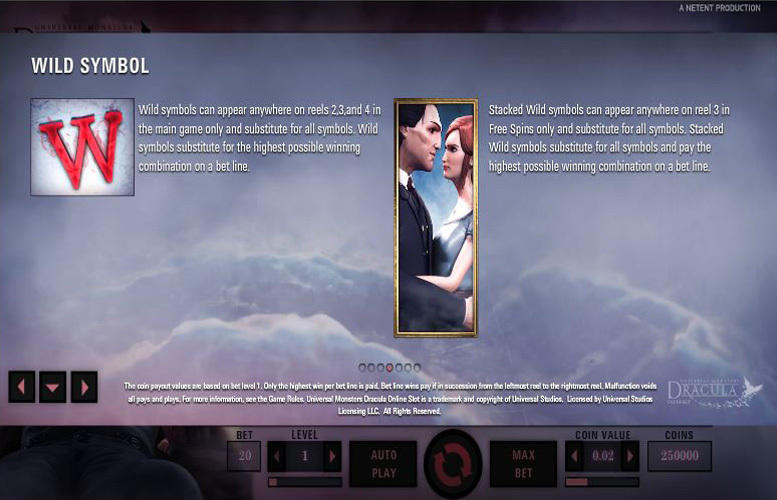 The game boasts a theoretical return to player percentage of 96.6% and loads of bonus features such as free spins, stacked wilds, a ‘Bat Feature’, 1-10 bet levels and seven coin values from 1p to £1. A popular game with an immediately recognisable theme, Dracula is a slot which offers players a great deal in terms of gameplay, betting control and potential winnings. 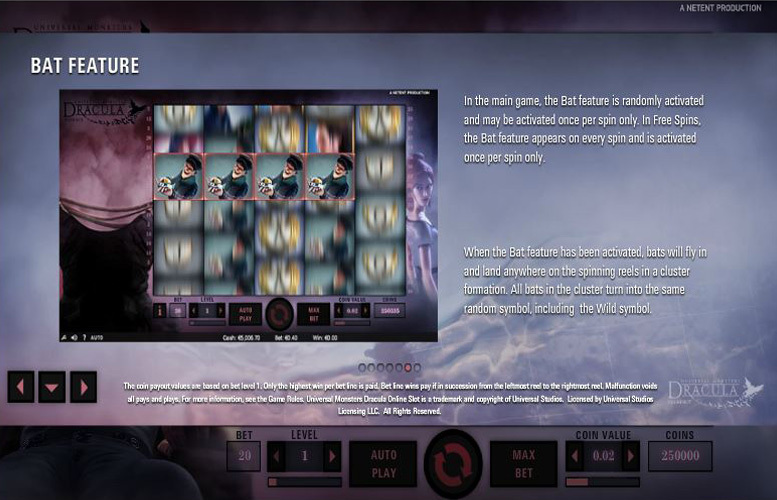 The best way to review the game in its entirety is to take an individual look at its main features, including the top jackpot, symbols, paytable and betting limits, and that’s what you will find below. In spite of the fun and attractive graphics and the exciting theme, Dracula is in many ways quite a simple slot. There are no bonus games per se and the way in which jackpots can be won is simply by lining up three or more symbols consecutively from left to right along the game’s 40 pre-set paylines. The most valuable of the game’s symbols are the stacked Dracula and Lady symbols which pay at a level of 200 times the bet level if five are achieved along any payline. The top jackpot which any player can win from a single spin therefore, results if they achieve five such symbols along all 40 paylines. That would result in winnings of 200 times the bet level for each of the 40 paylines, which at bet level ten equates to a top jackpot of 80,000 coins. With a highest coin value of £1 therefore, a player could win a jackpot of £80,000 from one spin. 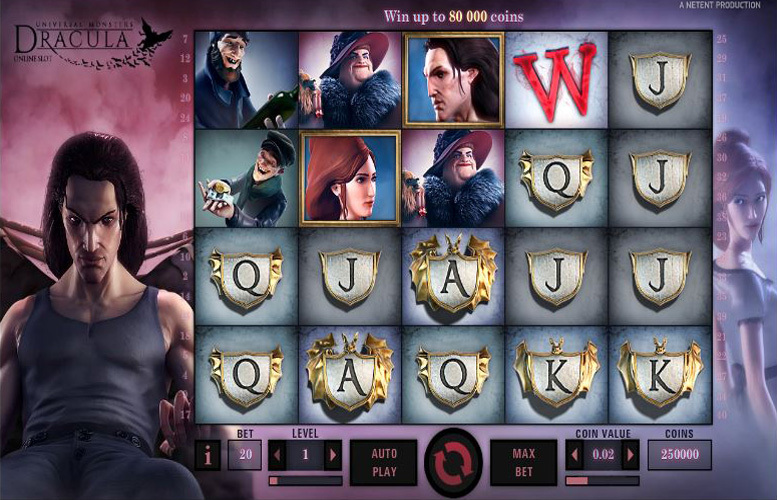 There are a number of different symbols within the Dracula slot which either have special functions or serve to activate certain features of the game. These symbols are namely the stacked Dracula and Lady symbols, the Wild symbols and the Stacked Wild symbols. As well as being the most valuable symbols within the game, the stacked Dracula and Lady symbols can also activate free spins. If they line up perfectly on reel 2 (for Dracula) and reel 4 (for the Lady) to display the two entire images simultaneously, then the player receives ten free spins. Those free spins are played at the same bet level and coin value as the spin which activated them. During those free spins is the only time that the Stacked Wild symbols appear during the game. These symbols substitute for any other symbol – as you would expect from wilds – but can also activate two further free spins if they appear fully visible on reel 3. During the main game, the normal Wild symbol serves the purpose of substituting for any other symbol as part of a payline. In all cases, wilds will always serve to make up the most valuable possible combination for any payline. As well as those three special symbols, Dracula has an added ‘Bat Feature’ whereby any number of bats from 4-12 (or 4-20 during free spins) can randomly appear. Once they have appeared they will settle on the reels in a random cluster and turn all symbols they land upon into an identical, randomly chosen symbol. The ‘Bat Feature’ occurs on a wholly random basis during the main game but is present after every spin of a set of free spins. Dracula has a straightforward and easy to understand paytable whereby the stacked Dracula and Lady symbols are equally the most valuable within the game. Both of these sets of symbols pay out at a level of 200 times the bet level if the maximum of five of them are lined up along a payline. Behind those two symbols, the next most valuable are the set of three other human character symbols which all pay out at a level of 60 times the bet level for five consecutive symbols on a payline. There are a couple of different ways in which a player can alter the amount they bet per spin when playing Dracula. There are ten different choices (from one to ten) when it comes bet level that determine how many coins are wagered per spin and which increase by 20 from a minimum of 20 all the way up to 200. There are then seven different coin value settings that determine how much each coin is worth and which span a range from 1p to £1.00. At the lowest bet level and coin value therefore, the minimum possible bet per spin is just 20p and at the highest levels, the maximum is a lofty £200. Dracula is a slots game which has a lot to like about it and not many notable weaknesses. The gothic horror theme of the game is one likely to be popular with many people and the graphics associated with that theme are attractive and interesting. 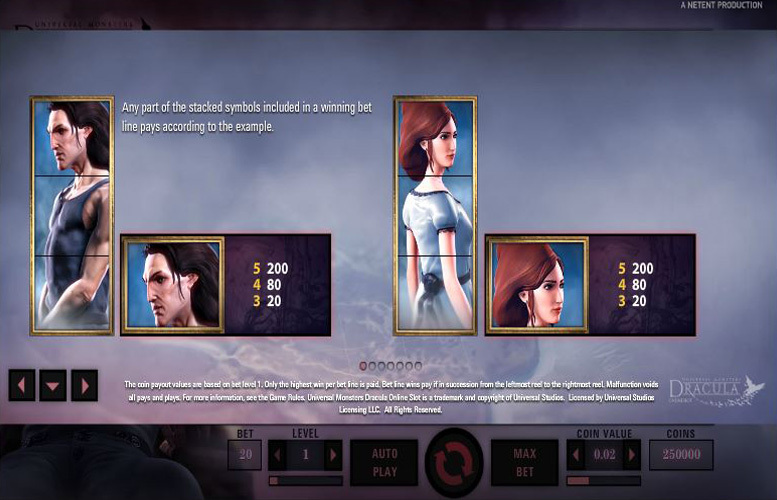 The gameplay of the game too is simple enough that a new player can pick it up quickly but has enough added elements, such as the ‘Bat Feature’, stacked symbols and free spins, to keep it interesting. In terms of betting control and potential winnings too, Dracula compares well with most slots around. Players have a choice of ten bet levels and seven coin values to stay in charge of their wagering amounts and the top jackpot of 80,000 coins represents 400 times the value of a player’s bet, which is unquestionably a generous potential payout. This game has a rating of 3 / 5 with 522 total reviews by the users.